As social media becomes more and more a part of our lives, etiquette failures can occur when there are so few precedents. A wedding day is the perfect example of this. You want to share your special day with your social circle, especially those who can’t attend, but where do you draw the line? We’ve talked to experts in the wedding industry and a recent bride to try and establish the ground rules for tastefully using social media at your wedding. Check out their advice and let us know your thoughts and experiences in the comments below. 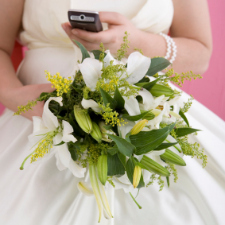 Introducing wedding attendees online before the big day can help you avoid any day-of awkwardness. This will give people the chance to break the ice and virtually get to know a little about everyone else. “Help your wedding guests mix, mingle and stay in the loop with a private social network created just for engaged couples, like OneWed’s Wedding Pre-Party,” suggests Azure Nelson, the marketing manager and editorial director of OneWed. If you’d like to skip the specialized sites route, you could also create a pre-party on Facebook using its “Groups” functionality. This can be a clever way to avoid cluttering the news feeds of folks not invited to the wedding, both before and after the event. If you want your wedding to be recorded for posterity in 140-character posts, then let people know and even encourage them to get involved by creating a hashtag. “Tell your bridal party it’s OK to tweet!” says Howard. “Create a hashtag for sharing your event. This will make all tweets from your day easy to find later on and helps to create a feeling of celebration for your guests. You can take this even further by appointing a “Chief Tweeter” — or several — to document the day. “Have an Official Tweeter and Well Wishing Station — have one or more ‘Tweets of Honor.’ Have some technologically obsessed friends? This is a great job for them! These folks can quietly tweet from a corner as not to be obtrusive or can come out of the shadows and provide you with a full on social media guest book station,” says Howard. And you can even incorporate social media into the more traditional parts of the day. In addition to reading cards and messages out loud from family and friends that couldn’t make it, why not read messages from Facebook and Twitter too? “Have your Tweet of Honor compile some well wishes that have been tweeted out and share them during the toasts. This can be a very fun twist on the traditional toasting time,” suggests Howard. There’s a way to keep a traditional look and feel to a wedding celebration and still make room for social media. A “social media station” is a place where those who want to connect or comment online can do so, without forcing the issue onto the uninterested. This can also work for photos, as well as text-based communications. A live stream of photos from the event can be a fun way to engage people and encouraging sharing. “Ditch the tacky disposable cameras and set up a shared Flickr account so that guests can upload any photos they may take,” says Liene Stevens, former wedding planner and CEO of Splendid Communications. “This doesn’t replace hiring a professional photographer, of course, but it does allow you and your guests to share in their view of your wedding,” Stevens says. Jodie Welton, a founding partner of Connected PR who got married this summer, went down this route and had a huge projector showing images of the day for her evening reception, as well as a separate area for filming. “We thought it was important that the guests are absorbed in the wedding and that social media enhanced the experience, rather than distract from it. So, to keep it ‘away from the party’ we had a designated area for guests to be filmed,” explains Welton. Thanks to the wonders of modern tech, nowadays you can share your special moments with people who can’t make it in person. Ustream is one such site that can help you share your ceremony with those well-wishing from afar. “Live weddings give our users an opportunity to experience Ustream in a completely new way. It’s very exciting to see our broadcasters offer unfiltered access to the best moments of their lives. That’s one of the many reasons we’re here,” says Ustream’s Tony Riggins. Howard notes it’s a particularly useful option for anyone getting married abroad or far from home. “The use of Ustream to share (publicly or privately) your day live online for friends and family that cannot make it to your ceremony is especially useful for those having destination weddings. If Great Grandmother cannot make it, she can still virtually attend and share in your joy,” Howard says. “Changing a Facebook status from engaged to married just after the vows is a growing trend, but don’t miss taking in those moments with the people actually there with you. Put down the phone and enjoy the company of those who came to celebrate with you,” says Stevens. You only get one wedding day — if things go as planned, anyway — so don’t waste any precious moments you could be interacting with real-life people. Rest assured anyone who is following your day online will certainly understand your priorities.